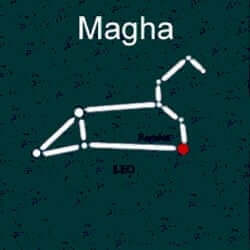 The Magha Nakshatra’s cosmic representation is the shoulder of the lion in the constellation Leo. This star, known as Regulus is actually a triple-star: three stars that appear as one. The embodiment of Magha birth star, ‘the mighty one’ a well-loved ancient king, the Nakshatra is symbolized by Magha’s royal palanquin. This was the person powered vehicle he sometimes travelled in. The Pitris, known as the ancestors of human kind, are the rulers of this Nakshatra. As keepers of ceremony and traditional knowledge the Pitris are humanity’s guardian angels. Charismatic, playful and generous these attractive people have a dignified presence. They are very particular about their outward appearance. From the way they walk and talk to their distinctive laugh, their sense of self-respect is apparent in most situations. \When working at their highest level the Magha native will walk a gentle path and be endowed with comfort and abundance. Known to be wise beyond their years, these natives can be very spiritual creatures. Governed by the dark and malefic planet Ketu, an imbalanced Magha may become unbearable. Intellect fades to arrogance, assertion turns to aggression and they will not hesitate to strike the first blow when in conflict. The Magha male is noted for his thick, luxurious hair and females are prone to thin hair and receding hairlines. Both genders are of average to tall height and have good bone structure. Known to have bloodshot eyes they often have a prominent mole or other feature on their hand or shoulder. Respectful creatures, the Magha value all that is good and true. They are trustworthy and affectionate people who avoid gossip. Generally soft-spoken and loyal to a fault, they will protect friends and family ferociously. Smart and wise, they have a firm grasp of the present and may be very spiritual. They are committed to cultural awareness and hold strong reverence for traditions. Magha birth star people are concerned for group well-being and are often found working in the social services sector. Inquisitive by nature, they can also be found in the sciences and research fields. Natives of the Magha Nakshatra are capable of hard-work. While they possess many leadership qualities, they favor intermediate positions as they are not exactly business oriented. Although they have good earning potential, their finances may be variable as they experience periods of ‘feast and famine’ like their counterpart the lion. The family oriented Magha tends to have a happy stable family life. They are prone to having very large families. Generally healthy, many natives of the Nakshatra will be night-blind. Other common health issues include asthma and epilepsy.